Thousands of people have packed into Shed 10 and spilling out onto the wharf. Now a waiata for Team NZ. Dave Dobbyn to sing his classic Welcome Home. Few tears being wiped by crew members and their families as Dave Dobbyn performs Welcome Home. Can hear DaveDobbynfrom the Hilton! Len Brown talking at the beginning - rude! TVNZ commentator Peter Lester: It's been one hell of a journey for them and us and one that has made us richer as a country I'm sure. The speakers today will be Auckland mayor Len Brown, Economic Development Minister Steven Joyce, Team NZ boss Grant Dalton and the helmsman Dean Barker. First up a video on Team NZ's journey. Len Brown: Emirates Team NZ you guys are the business. 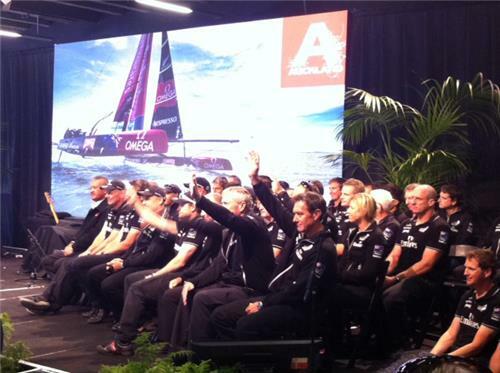 Brown: We wanted to bring you here the right way into Shed 10 the heart of Emirates Team NZ. Every day we were here riding with you. We were with you on every tack and every gybe. We all hated that minute when they cancelled that race too early....let's give it up once more for Emirates Team NZ. The crowd chant 'Team New Zealand'. 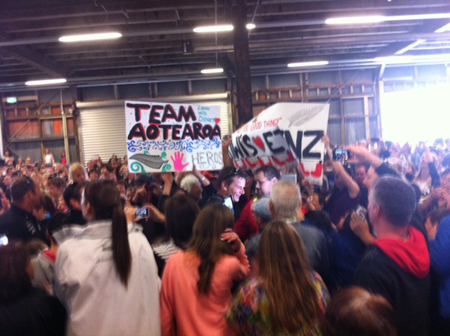 Chant of "Team New Zealand" rings around Shed 10. Another video of how the ETNZ fans watched the action from Shed 10. 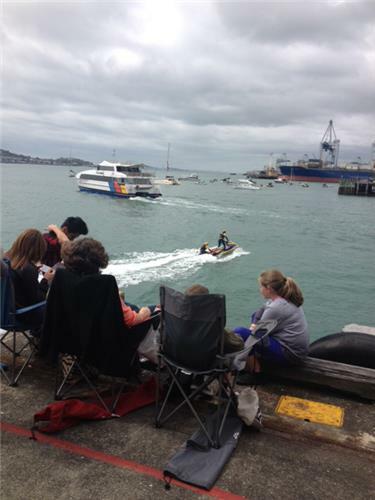 The fans that have come to support ETNZ after losing the final race, are watching a video of other fans watching ETNZ lose the final race of the America's Cup. It's all very meta. Now Steven Joyce. Will announce some more funding? Joyce: What a fantastic welcoming. These guys deserve this. This whole team on and off the water threw everything they had at this event. "While you didn't set out everything you wanted to achieve you won the hearts of this nation. Not just of our country but of America and all other countries which watched the coverage. "As I've said to Grant and Dean 'you've got a lot of work to do". I said 'work on a proposal and we'll help you out with it'. "This country and this Govt stands ready to be part of the next #AmericasCup challenge." - @stevenljoyce pledges #TeamNZ Govt support. come on guys, we have to race again - bring the Auld Mug back to its rightful home!! thanks for the ride - u hav all of NZ's support!!! Yes Vicky we will have video. Another video presentation. Next up Grant Dalton. "Four more years, girls." Overhead from one #TeamNZ wife/girlfriend to fellow WAGs. Would love to be there, but its a work day! So pleased that lots of people are able to be there to show the support that all of New Zealand has for this team! A great show of integrity and dedication throughout the whole regatta. The team did us proud and I am so very proud to be a Kiwi because of them!